Of course it would be possible as well to play with Bishops for Advisors Then you would not even need the extra Queen. The pieces sold at the link you gave are indeed very suitable for 'butchering'. Especially the 'Superior Classic' wooden Chess pieces of the larger sizes (e.g. 3 1/2'). (middle right), Knightmate (bottom right) and Xiangqi (bottom left), and an Amazon (middle left). The King in the center is for size comparison. which can be used as Advisers in Xiangqi, and mini Kings, which can be Commoners for Knightmate. provide the Rooks for making Cannons (using 2 of the 8 superfluous Pawns as bases). Two other Pawns go on top of 2 of the 4 Knight bases left over from the Cancellor production. These 'giant' Pawns can be used as Xiangqi Elephants. the Advisers. The set that provided the Cannon material can also provide an unmolested Queen. Knights of the third set into Amazons. Yes, we discussed that before. $150,000 fixed cost for a full 40-piece set? but can be manufactured in quantities of 10-100. I would add Elephants to that list. I don't mind the Xiangqi Horse being represented by a normal Knight (although for experienced Chess players the difference between the two is the biggest stmbling block for playing Xiangqi). But I am not sho charmed by the representation of an Elephant by an ordinary Bishop. 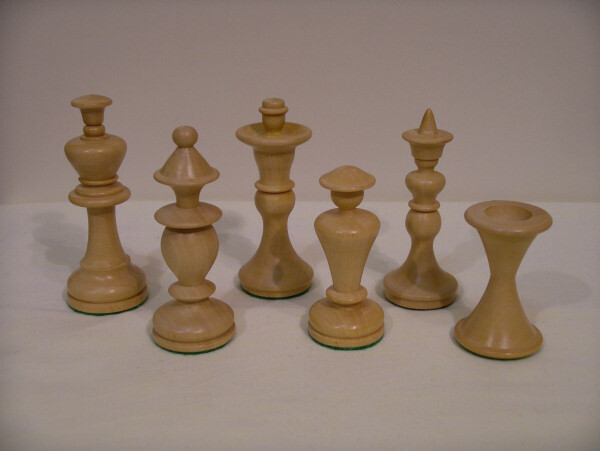 As I pointed out elsewhere, most of the pieces you mention are quite easy to make from a normal Staunton Chess set. I am not sure what you mean by 'Vizers', but I assume you mean the pieces next to the Xiangqi royal piece. They could be decapitated King and Queen of a normal set. (I don't think the 'head' they have here in the photograph, somewhat reminiscent of an old-fashioned coal can, adds much esthetical value.) The Queen's head could then be glued on top of a Knight, (after grinding off the ears), to make an Amazon. The upper part of the other Knight could be glued on top of an inverted Rook to make a Chancellor. A V-shaped cut in the Bishop's head (making use of one of the cut that is aready there)could remove the top of the Bishop, and make it an ArchBishop. When done carefully, all this would provide high-quality pieces that blend in perfectly with the normal Chess set they were made from, and starting from two equal sets would automatically supplement the number Pawns you ned for wider boards. You would actually have a surplus of Pawns, and a Pawn glued on top of a Knight's base could be another general-purpose piece. (Unfortunately you can't make a pair of those, if you use the other Knight for building an Amazon.) Biggest problem are Cannons and Elephants. The Cannon's could be made from Knight's bases plus some parts specally manufactured for the purpose. To make something that remotely looks like an Elephant, even in an abstract sense, is a problem in itself. If we would really want to sell such pieces through this website, the best way might be to strike a deal with a manufacturer of normal Chess sets, to order pieces or piece parts individually, so that we are not limited to the frequencies (or sizes!) with which they occur in normal Chess sets. We could then, for example, use a Bishop of a larger size to convert to Archbishop, and we could buy the Knight heads and bases separately. Unlike plastic pieces, wooden pieces are manufactured completely independently, and not having to assemble the Knights only saves the manufacturer money. I have looked at retail prices of wooden Chess sets, and some acceptable sets are already sold on the internet for €16,90. (I could even find sets for €7,99 in the toy shop, but they are of ugly design and rather smal size.) This amounts to ~50 cents per piece. In general, a manufacturer should be happy to sell his products for the retail price. They are beautiful sets. Those are 2 very nice variant pieces. It occurs to me as I'm typing that these pictures have just gone far toward backing up Mr. Hutnik's contention that we need real pieces. Some of the recent variant pieces we've seen have been almost spectacular. I find the representative pieces, like the cannon, to be somewhat more attractive as pieces. The really abstract pieces are not always as instantly recognizable. Here, of course, they're obvious. I could be jealous quite easily here. :-) Excellent pictures. Thanks. My girlfriend's sons prefer using this set for Chinese Chess, and I agree that it could get more Americans and Europeans into the game. Unfortunately, it is not in production, and as far as I know, my sets are rare antiques. It would be great if some other company would start producing something like this. With the greater exposure that the web is giving to Chinese Chess in the west than it ever had here in 1973, a set like this has a better chance of turning a profit. Looks like something that could get more Europeans and Americans into Xiang Qi. All it neweds is a really good marketing campaign.